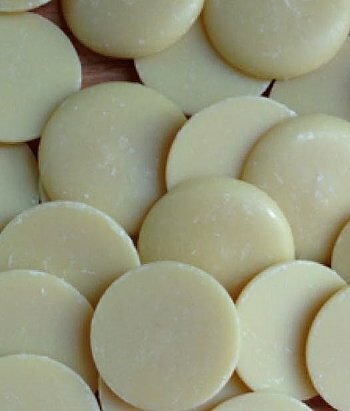 Organic Cocoa Butter in easy to use wafer form. Cocoa butter is a natural vegetable fat which is extracted from the cocoa bean during the process of separating out the powder and liquor from the bean. This organic cocoa butter has a delightful chocolatey aroma and a firm consistency. We now offer cocoa butter in "wafer" form, making it easier to measure out and melt. Cocoa butter is very stable and adds a rich, creamy consistency to lotions, soaps and creams and other aromatherapy applications. Cocoa butter is a favorite for skincare. It's very beneficial for helping to reduce skin dryness and improve skin elasticity. Cocoa Butter should be stored in a cool dark place and has a shelf-life of approximately 2 - 5 years when stored properly. Review: i am in love with these little cocoa butter wafers. they smell like chocolate and are so buttery smooth. i like how easy they are to melt since they're smallmakes measuring and working with them much easier than with the chunks of cocoa butter. Excellent quality!